Susan's Saga: Blog Candy from Lee! Join The Fun with The Craft Sisters! I was completely gob smacked to receive this box of goodies in the mail today from the lovely Lee, all the way from Colorado! I won some blog candy at Lee's wonderful Blog a few weeks ago and was honoured with choosing my first Gina K stamp set, paper piercing tool and templates Yay!) and some scrummy bling. 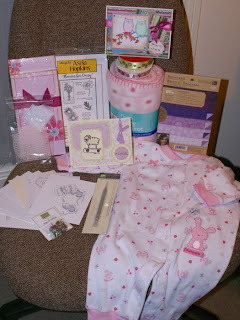 But when the package arrived, Lee had sent me RAKs of love for me and my new granddaughter as well!! Lee, you are a very generous and kind person to have sent me such a cornucopia of gifts! Thank you from the bottom of my heart! You sure inspired me to do some papercrafting today as well! 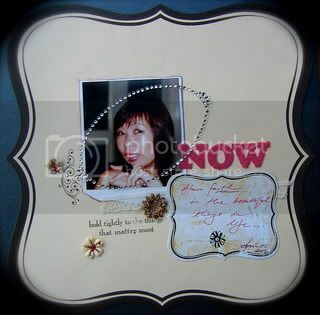 I've already used some of that sweet butterfly ribbon and the note paper ....more about that later! Oh I'm soooo glad it made it there safe and sound!! I've been so impatient as it's just so fun to see the excitement from a Happy Mailbox!!! I'm glad you love everything and can't wait to see what you create!! You are a very giving and special lady yourself and I'm so thrilled to call you friend!! I agree you are a special lady. you deserve all that scrummy stash and the baby sleep suit is sooo cute. thanks for the tutorial on the spinner card. there is a little something on here for you. How lovely to have such a Happy Mailbox day , Susan ! you are blessed indeed ! Shop Now at my Stampin' Up! Site! Click on the Logo above to go there - you know you want to - Lol! If you are interested in stamping and papercraft supplies and digital scrapbooking and/or smash journals, shop now! Would You Like to Own Your Own Web Business? Search for Papercraft Topics Here! Daring Cardmakers (DCM) - a new card making challenge or two every week! All content (including text, photographs, and design work) is © Susan Hurley-Luke. My original artwork and writings are for personal inspiration only and may not be copied for publication or contest submission. All content is the sole responsibility of Susan Hurley-Luke, Independent Stampin' Up!® Demonstrator and the use of, and content of the classes, services, or products offered on this website are not endorsed by Stampin' Up!